Wow is really all I can say. 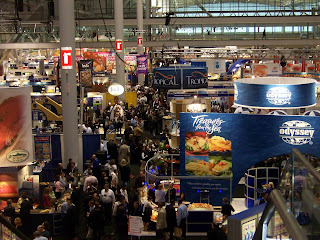 Yesterday I attended the International Boston Seafood Show, held at the Boston Convention and Exhibition Center. Now I have been to this facility before, for several different reasons. Parties that I have attended have been held here (it has an incredible view of Boston), and I've visited a friend working at a trade show here, but never before have I entered this massive space and smelled such wonderful smells as I did when I walked into it yesterday. Now, as I'm sure we all know- yesterday (and today for that matter) dawned rainy and cold. Rainy might be an understatement- monsoon might be a better term. So I won't lie to you and say that I bounded out of bed excited to head to South Boston for the day, nor was I brimming with excitement as I began the walking portion of my journey through pelting rain, and wind gusts that made it difficult to make any progress. When I finally got to the convention center I was soaked, windblown, frozen and cursing everything around me...until, that is, I got inside. The aroma that greeted me immediately upon entering the massive facility was of summertime, seafood, and clam shacks. 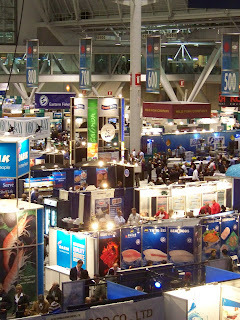 The cold wasn't so cold anymore, and I breathed in deep ready to "dive" into what lay before me at the International Boston Seafood Show. of the "behind the scenes" vendors were there too. Before yesterday, I had never given any thought to if crushed ice, or flake ice machines are best for preserving fresh fish. The folks at A-1 Refrigeration Co have- they think its flake ice. 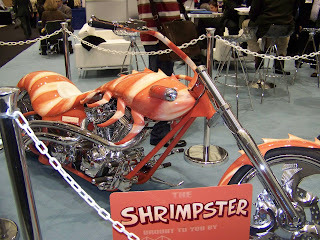 I learned about the merits of Mexican based shellfish, how they are packaged and shipped abroad. I sampled lots of tasty delights- popcorn oysters, soft shell crab, and all sort of other assorted treats. Finally I found my way to the iPura booth. 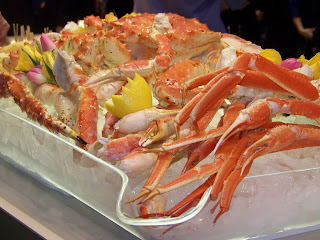 I started following iPura on Twitter, and in general, last fall after the Sustainability dinner at Turner Fisheries. It was at that point that I really began to think about where food comes from, possible damage that we could be doing to our earth by our practices, and the importance that we must place on ensuring that for every resource we use, we put back the same amount. 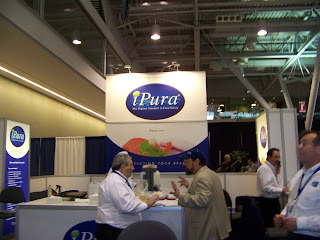 iPura is a company founded on the principles of clean, safe food. Their mission is to ensure that the food that bears their seal is the "Highest Standard in Food Safety". Their concept is simple, yet incredibly important. They have established a system processes that keep foods safe and clean, in their organic state, prior to packaging. It can really be broken down to -iPura is keeping us healthy and safe, and the earth. Can't really beat that now can you? 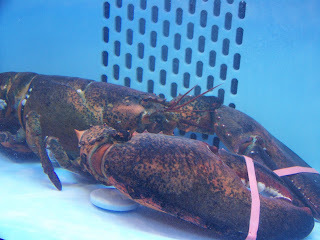 I'll conclude my lecture there- but I leave you with two thoughts- one-please visit the iPura website for education- the work they are doing affects us all, and two- if you can-venture on over to the International Boston Seafood Show- if for nothing else- to taste summer and to see the 45 year old lobster who is hanging out there. I want one of his claws ;-). IBSS website for show dates and hours.